Inspired by women classic hats the Miss Shield Shadowglossy is equipped with a long visor and a customizable frontal band. This helmet meets CE EN1384 (Europe) and ASTM/SEI F1163-15 (North and South America) standards. The Miss Shield Shadowglossy is customizable. Create a unique version by customizing the frontal band, the top, the blazon and the trim of the helmet! Call or email us for custom orders! The outer shell of the Miss Shield Shadowglossy is made of polycarbonate, which is a material used for high-end motorcycle helmets. It is covered with metallic glossy painting. The internal comfort foam (liner), shape memory-kind, ensuring a constant thickness over the years of use and the semi-rigid jugular cancel all risks of tipping the helmet in case of a violent movement. This liner is removable and washable thanks to a strong clip system. Equipped with a front air inlet, the Miss Shield Shadowglossy helmet provides exceptional ventilation. The Miss Shield Shadowglossy is available in black and blue. 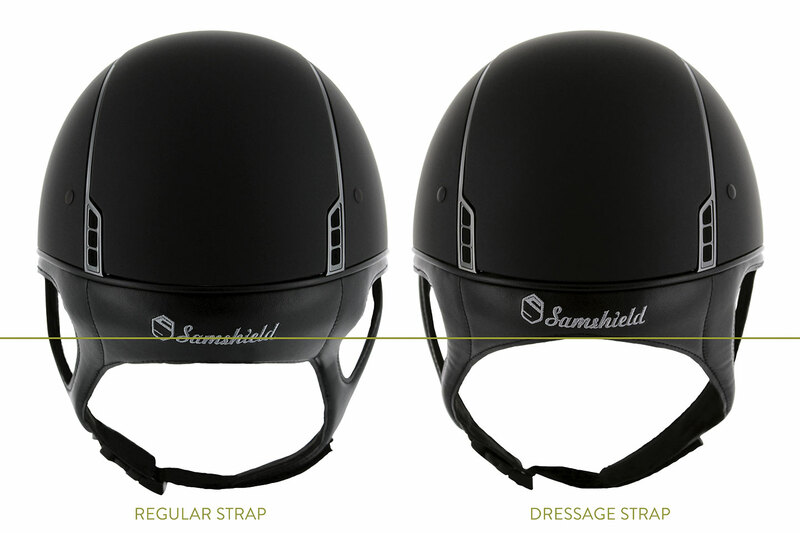 This helmet is available with the dressage chin strap option: this option allows women to wear their hair in a bun without being constrained by the harness of the helmet. This chin strap is shorter by 2.5 cm in order to allow more room for the hair bun.